With diseases other than smallpox we have shown that 90% of the decline in mortality occured before vaccines were introduced. Due to the very old history of both vaccine (from Vacca, meaning 'from a cow') and variolation, the inoculation of pus from a human sufferer of smallpox to another human, we can not show a graph with the same 90% decline pre vaccine. 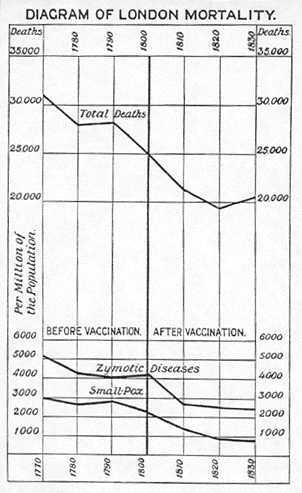 There are graphs available which show smallpox decline prior to vaccination as well as show that vaccination was ineffective in preventing smallpox. BC to AD? : For more than 1100 years, China possessed a ground dried scab, inhaled smallpox 'vaccine'. Middle Ages: Arabia - Smallpox inoculation practiced. Note: smallpox decline prior to introduction of vaccination. Note: decline of death from all causes prior to 1800. Was this general decline, and the specific decline in smallpox due to sanitary reforms begun in the mid 1700's, or the practice of variolation? (the inoculation of human pus from smallpox sufferers into other humans.) This question must be given a good answer. More information is first required. Note: the graph runs from 1838 to 1882. On the left, from 1838 to 1853 is the time of 'Encouraged Vaccination'. From 1853 to 1867, 'Compulsory Vaccination'. And from 1867 until repeal, vaccination enforced by 'Penal Codes'. Yet in 1872, a very large epidemic of smallpox occured. (England and Wales) Some abandoned vaccination at this point and began putting their efforts into sanitation, the true immunization against a filth caused disease. "Since Edward Jenner demonstrated the use of cowpox vaccine against smallpox in 1796, vaccinations against smallpox were started. Despite this, a smallpox epidemic swept England in 1839 and killed 22,081 people." "In 1853 the Government made smallpox vaccinations compulsory, but the incidence of the disease kept increasing, ..."
"1878-96 inclusive, unvaccinated Leicester had so few smallpox deaths that the Registrar-General represented the average by the decimal 0.01 per thousand population, equal to ten per million, while for the twelve years 1878-89 there was less that one death per annum. Here we have real immunity, real protection; and it is obtained by attending to sanitation and isolation, coupled with the almost total neglect of vaccination. Neither army nor navy can show any such results as this." 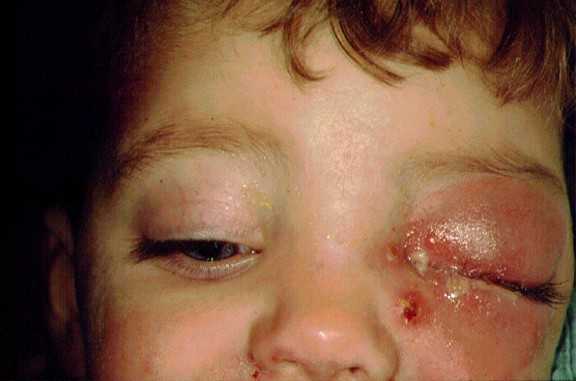 The following pictures are of 'vaccinia', which is smallpox when induced by vaccination. 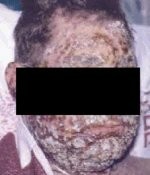 The last photo is a seven year old boy whose father is in the US Army Special Forces: (2002) See whole story and larger picture at: http://master.emedicine.com/email/image23.html. 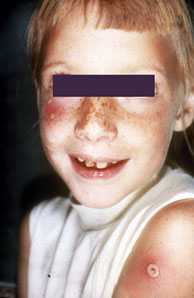 The remaining photos are from the CDC web site. "World health records (England, Germany, Italy, Mexico, the Philippines, British India, etc.) document the devastating epidemics which followed mass vaccination. The worst smallpox disaster occurred in the Philippines, after 10 years (1911-1920) of a compulsory U.S. program which administered 25 million vaccinations to its population of 10 million. The result: 170,000 cases and more than 75,000 deaths from smallpox. History past and present is replete with similar tragedies. "Public education" by vaccine producers and their supporters always omits self-incriminating facts." 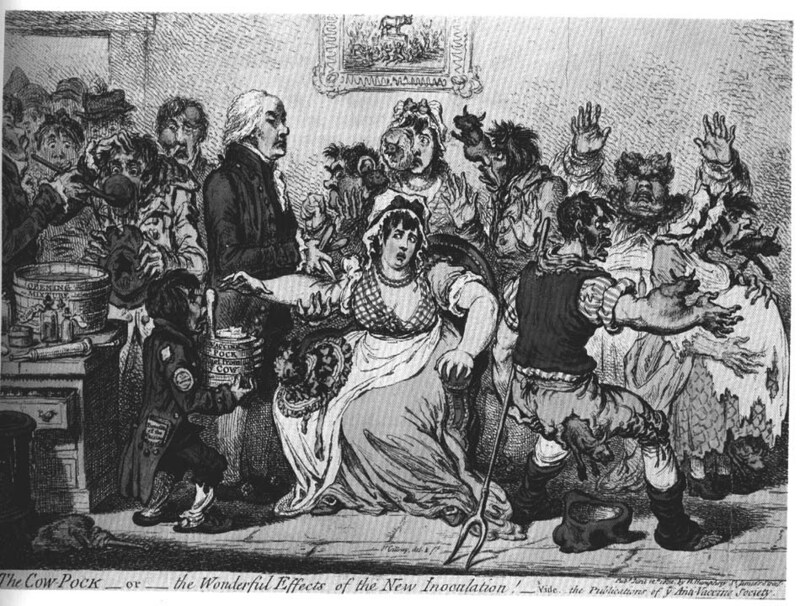 published this cartoon in 1802 to satirize Edward Jenner and "the Wonderful Effects of the New Inoculation." The cartoon depicts inoculated people acting like a bunch of animals and developing cow-like appendages. On the wall hangs a picture of the Old Testament story: The worship of the Golden Calf.